With the advent of cloud computing and storage, the archaic practice of tape drive backups and hastily written batch scripts are now behind us. The sheer simplicity of the old ways did have a certain je ne sais qoui, but data is often a company’s biggest asset, and the backup business is thriving as a result. Nowadays, when the job of backing up servers falls on your plate, you are tasked with comparing dozens of similar solutions, with minimal but important differences. In most cases, you aren’t just comparing the backup software but the supported storage options as well. If we adhere to the 3-2-1 rule for our backup strategy, we need 3 copies of our data stored at all times, 2 kept on local media of different types and at least 1 located offsite. This practice guarantees that no matter what happens, there is no single point of failure and it’s always available. 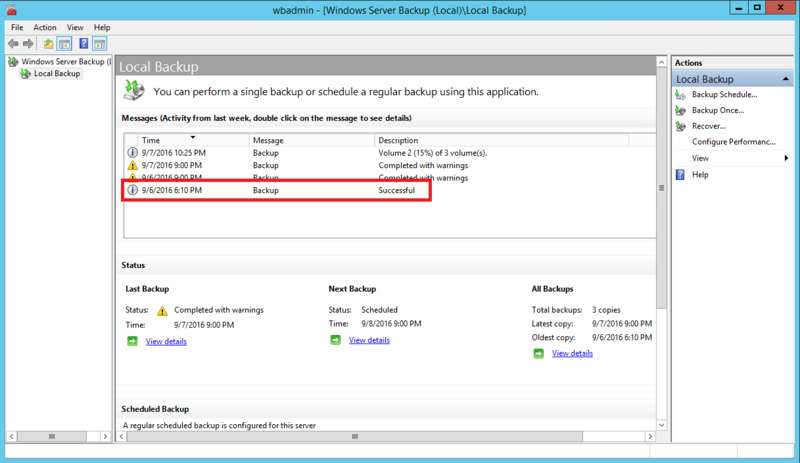 Why Backup A Windows Server? For the most part, servers are where all of a company’s files are stored, including the most critical business data. The unexpected loss of these documents can be catastrophic to an operation of any size, and without proper backups that is an entirely real possibility. Whether your servers use mechanical or solid state (SSD) drives, these can fail without warning at any given time. A RAID configuration is often used to mirror the drives, maintaining a second copy in case the first was ever lost, but these disk arrays can fail too. In fact, it is a very common misconception that RAID is the equivalent of backups, when in fact they are quite different. RAID is simply a form of redundancy, helping to recover from unexpected failures. 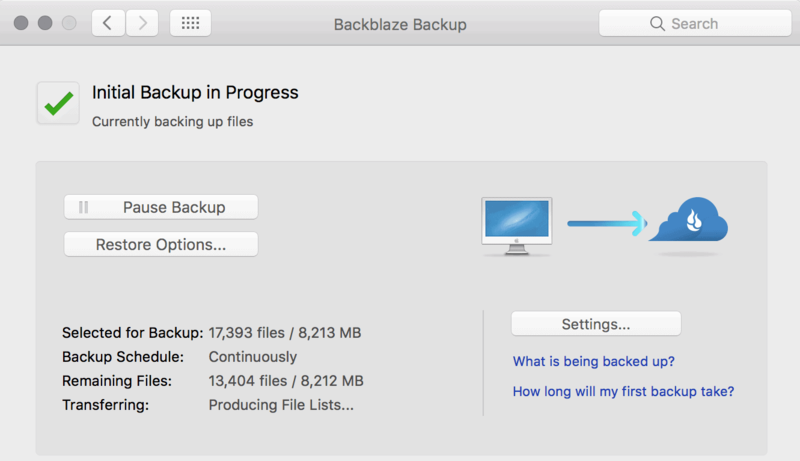 Backups on the other hand allow for versioning (storing different iterations of the same file) and essentially give you the option of rolling back time. So why should we backup a Windows Server? Hardware failure is the most frequent reason, but there are plenty of situations that it can prove beneficial. Ransomware for example has become a serious threat to commercial enterprise, and offsite backups will make this a non issue. 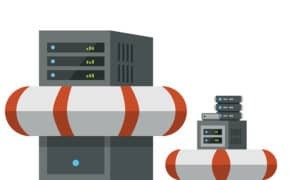 How do Server Backups Compare to Personal Backups? Backups themselves aren’t much different between servers and home PCs. They are just copies of our important data, stored as insurance in case the need should ever arise. How the data is backed up, where it is stored and how quickly we can recover it are the main concerns for servers. A home user is just happy to get their files back, even if it means waiting weeks for a company to ship the data to them on a new drive. For servers, time is of the essence and in many cases, anything less than instant is unacceptable. Server oriented backups emphasize things like file consistency, encryption and bleeding edge technology for the fastest read/write speeds possible. When we evaluate the various Server Backup solutions, there are several core areas that should be considered. While home users just look for ease of use and minimal upkeep, business needs often dictate the requirement for advanced functionality, infrastructure scalability and granular control. Our focus is Windows Server, so that’s an obvious must have for any solution to be considered. Past that, we may need integration with software like Microsoft Exchange Server, SQL Server, Sharepoint Server, etc. What about about mobile backups for iOS and Android? Hypervisors and virtualization are often used in some capacity, so VMWare or Hyper-V support may also be needed. It’s good to know what choices we have when it comes to storing our backups. With cloud being the the new standard, some only support the use of their own in-house storage services, while others interface with dozens of the leading cloud providers (Amazon S3, Microsoft Azure, etc). If you plan to backup to local media, make sure to check this is available, where it’s becoming less supported in modern solutions. Cost is often the deciding factor in the choices we make, and backup software is no different. Unless we intend to use local storage, there are often two separate fees that we have to consider. The software license is the most apparent, often set on a per Server basis and billed annually (with perpetual licensing sometimes available). The storage costs are the second expense, usually billed at $/GB, either through their own cloud hosting or at a 3rd party site. Acronis is one of the most recognizable names in backup solutions, offering a complete suite of tools for data protection, storage and recovery. Tailored packages are designed for a variety of needs, ranging from personal use, business environments and even full scale service providers. Backup 12.5 supports 16 different platforms out of the box, including Windows Server and Linux, Android and iOS, and 6 of the most popular VM solutions (VMWare, Hyper-V, XenServer and more). 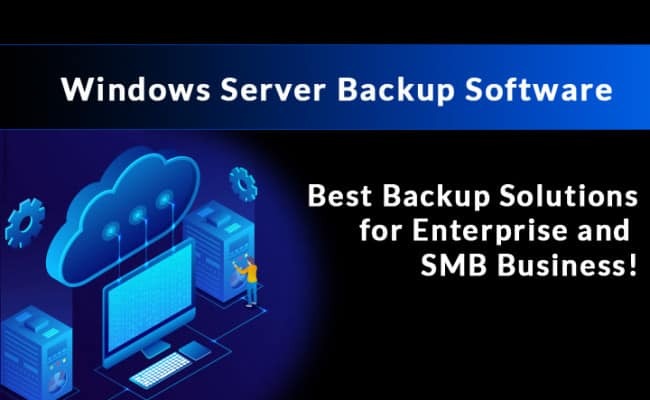 With heavy emphasis on Microsoft products, it also features native backups for applications like Exchange, SQL Server, Active Directory and so on. 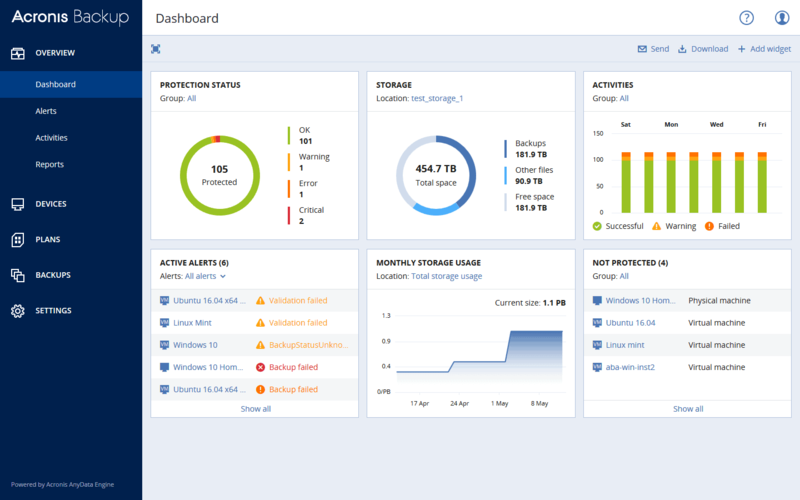 The extensive list of supported solutions is quite impressive, and one of the features most unique to Acronis. Unfortunately it isn’t all included under one price. When it comes to licensing for Windows Server or Windows Server Essentials, it only covers a single physical or virtual machine. Backups for mobile, Office 365, etc. require additional licensing on top of that. Considering the cost for servers is nearly 10x that of workstations, a complete backup solution can drive the price through the roof. So is it worth the price? Acronis Backup 12.5 caters to some of the largest brands in the world, and has optimized their solutions for speed and efficiency. By leveraging a combination of different technologies, they boast an industry best RTO (Recovery Time Objective) of 15 seconds or less. In turn, Acronis is capable of providing full availability without downtime, essential for mission critical systems and applications. As a whole, Acronis is among the best backup solutions without a doubt, but it does come with a hefty price tag attached. For large organizations and commercial enterprise where cost is insignificant, it will serve to meet and exceed any demands. Small business users will however find the expenses hard to justify, and similar options are available at more affordable rates. A number of factors influence the total cost, depending on the operating system, duration of licensing and add-on capabilities. Workstation PCs are most cost effective, and the perpetual (life time) license can reduce long term cost for a large, single fee upfront. CloudBerry Backup is not a traditional backup solution, but rather an innovative take on infrastructure-as-a-service (IaaS). Instead of pushing users towards their own cloud storage, it integrates with dozens of 3rd party providers instead, such as Google Cloud, Microsoft Azure and Amazon’s AWS to name a few. Using the Comparison Chart found on the CloudBerry website, we can easily view the capabilities of each provider side by side, determining which one(s) will best meet our needs. It shows which offer encryption, compression, max object size and so on. The most important column to consider though is Block-Level Backups. Block-Level Backups are one of the most integral features, similar in many ways to incremental backups. Using snapshot technology, it can copy only the data that has changed since the last backup, which helps to reduces storage requirements and bandwidth load. This can be extremely cost effective since cloud providers normally bill for both of these resources at $/GB. At certain providers like Amazon EC2 and Microsoft Azure, CloudBerry can also deploy an image backup as a VM. Instant system restores are an extremely valuable tool in mission critical infrastructure, creating an extra layer of redundancy in case fail-over solutions are needed. This same functionality even extends out to hypervisors, compatible with Hyper-V and VMWare too. Although cloud is the focal point of CloudBerry Backup, it’s not necessarily a must. There is considerable support for local storage options as well. It can backup to internal and external hard-drives, USB drives, network shares and even network attached storage (NAS) devices. Carbonite Safe Server Backup is a hybrid solution, geared towards small to medium sized business. With emphasis on their branded storage, it automatically replicates your data to the Carbonite cloud for protection. Out of the box, it has most of the features you would expect to find. It can create backups of not only physical servers, but external drives, NAS devices, virtual servers and more. At the software level, it also supports Microsoft’s SQL Server, Exchange Server, Sharepoint server and Hyper-V, as well as Oracle Server (VMWare not included). Most importantly, it can create image backups and do bare metal restores on both physical and virtual servers. It’s middle of the pack when it comes to license pricing, with two different plans to choose from. The Power Plan includes (1) server and (25) Workstations for $50/mo. The Ultimate Plan supports unlimited servers and (25) Workstations at $83.34/mo. Both include 500 GB of cloud storage and additional space is available at $99/100 GB. At bi-annual billing contracts or longer, you save an additional 5% for each additional prepaid year. 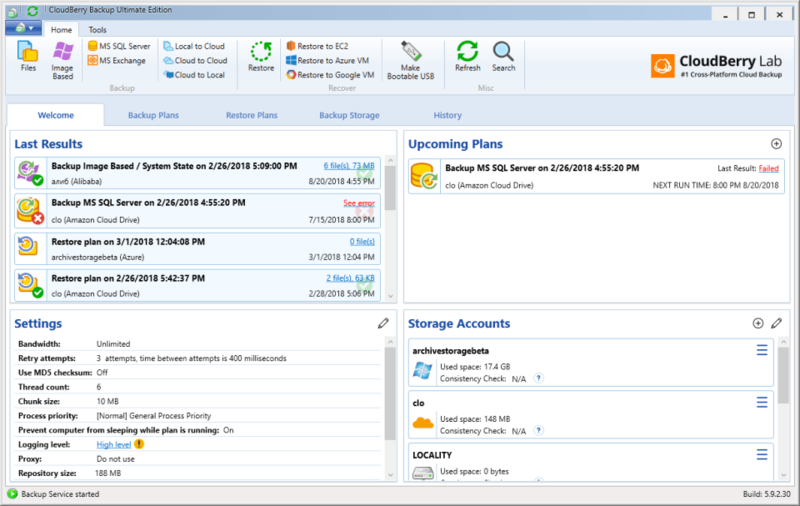 Overall, there is a lot to like about Carbonite Safe Server Backup. It has extensive device and software support, and the unlimited servers plan can pay for itself in larger organizations. Their US based support team is available 24/7 and has won awards for quality. For hospitals and healthcare providers, they are also HIPAA compliant, with 128 or 256 bit encryption. The only real downside comes from the cloud storage pricing, where $1 per GB is outrageous at 5x the industry average. Until the last couple of years, Backblaze has catered specifically to the home user market. In 2017, they combined their backup software and B2 cloud platform to create Backblaze for Business, an affordable server oriented solution for commercial use. In fact, the GUI interface is the same for personal and business, which is just a small, lightweight client that runs in the background. While it does lack advanced functionality, this is more than compensated for with the low price and ease of use. It has a flat $5/month license cost per machine, same as the personal edition and comes with unlimited data and bandwidth. There isn’t a perpetual purchase option, but you can subscribe to longer billing cycles for additional discounts. As for usage, there isn’t really much to it. Backups are taken based on file extensions, where everything like images, documents and e-mails are automatically copied. External drives attached to the PC via USB or firewire can be backed up as well. These files are then transferred to the B2 cloud, essentially mirroring your drive(s) until the files are deleted, at which point they will remain on B2 for 30 days. In a nutshell, Backblaze is the most economical choice. The pricing model is transparent and comes with no-frills software, what you see is what you get. There aren’t local backups, mobile backups or VM cloning capabilities, but it will backup the file structure of an entire PC to cloud, and in many cases that is all we really need. When your IT budget clashes with the cost of software, it’s hard to argue with a choice that’s free! Microsoft has included some form of native backup solution with almost every release of Windows in the last 20 years. First introduced back in Windows Server 2008, Windows Server Backup replaced NTBackup as the default service. Although it lacks the more sophisticated features found in paid products, it does offer powerful backup and restore functionality on a local level. As for capabilites, it’s able to back up a full server, system state, selected storage volumes or just specific files and folders. As of Server 2008 R2, they have also added support for automatic disk space usage, optimized incremental backups and recovery tools for damage or lost data volumes. Plus, you can restore a complete Windows image backup to different hardware for a full restore. When your responsible for picking out a backup solution, choosing one from the dozens of similar yet different options can be quite the task. There is no one size fits all package, and features important to one organization may not be what you values most. On the upside, with so much competition for your business, it’s a buyers market these days. Higher prices don’t necessarily equate to the best product, and we can often find the same feature rich tools in lower priced options. In many cases, greater cost tends to be associated with on-demand tech support, in-house storage solutions and other niche services, aimed at a small subset of users. For the sake of backing up a Windows Server environment, almost every choice is viable. It’s usually the more specific needs that determine which one is right for your infrastructure, whether this be mobile device backups or HIPAA compliance standards. For the average small business, CloudBerry Backup offers a feature rich platform at an affordable price. They provide the necessary tools and leave the storage decisions up to you, with an extensive list of supported cloud providers to pick from. With many competitors charging 2x or 3x the price for an annual license, CloudBerry’s one-time fee of $119 per Windows Server is phenomenal. Especially when we consider just how much they include in that flat rate. We still have to consider the price of cloud space on top of it (unless local storage is feasible), but the wide support for different providers makes this cost effective as well. In contrast to platforms like Acronis and Carbonite, we aren’t locked in to their storage, meaning we are free to shop around for the best deal.